High Town Police Department is the United Police Department of planet Earth. Historically, the main police departments were located in High Town, and that's how the United Department got its name. Now under HTPD control is not only the High Town City, but also the whole planet Earth and beyond. Just like the ordinary police of the past, HTPD’s main mission is to maintain public order and provide security. Local departments of HTPD are involved in investigation and prosecution of most crimes. Forces of several departments get combined in order to prevent serious crimes. System Security Service is responsible for political offenses, whereas all activities of the police are under the Internal Security Service supervision. General strategic directions of all the police and Security Services are implemented by the United Ministry, but the direct orders are transferred and optimized by Super Computer (Central Intelligence). In HTPD there is no centralized police control management, so the local police departments are largely autonomous. Every department carries out as many tasks as it can take over. Their leadership reports directly to the United Ministry. In the age of globalization and total "transparency" of the activities of the units, along with the ability to quickly and automatically implement analysis and generate recommendations for the actions, top-down command structure is not really needed. Why would anyone need mediators passing on orders to the local departments, if in special cases it can be done directly by the top management, and in day-to-day activities the System can automatically adjust the faulty set up by applying basic guidelines or else attract the attention of the Internal Security Service or of the System Security Service. According to monthly reports, zones of responsibility for each departments can be revised. Successful departments expand their areas, and low-performing ones reduce the number of patrolling sectors, sometimes to the extent of shutdowns. This structure results in better autonomy, flexibility and efficiency of the departments. The vibe of the healthy competition, binding the financial success of the department to the employees' personal rates, and accounting system of personal effectiveness statistically gives a better result. Mission «Xenomorph» was a result of a secret project of the System named «Xenomorph project». Derived from "Terramorfa" (also known as the Zoo-Battalion) «Xenomorph project» was initially based not on the existing animals, but on the theory of breeding new biological species by using the cell mutation and exposure on Mars and other extraterrestrial colonies. The project rapidly grew to the network of focus areas not connected to each other. At its best times, the project involved several thousand laboratories and personnel of tens of thousands scientists. Later on, things went into recession, and although some of the research results were still promising, most came out to be not just unsuccessful, but frighteningly dangerous. They started to wrap up the project. As a result, part of the labs and centers shut down and destroyed the samples, the other part found new owners represented by powerful corporations. Some labs fell into oblivion due to sample leaks and internal incidents, and some were attacked by «bio terrorists», and nobody knows what happened to the samples developed there. All the evidence that the project existed was carefully hidden by the System. The Liquidators had been seeing to it for quite a long time. As a result, no one could adequately assess the danger of the growing threat. Occasionally, odd incidents happened in the Low Town sewers and in underground communication tunnels of the High Town. Underwater colonies ceased to exist; space transport self-destructed. Despite the growing number of such incidents, each of them has been rationalized by an official explanation. 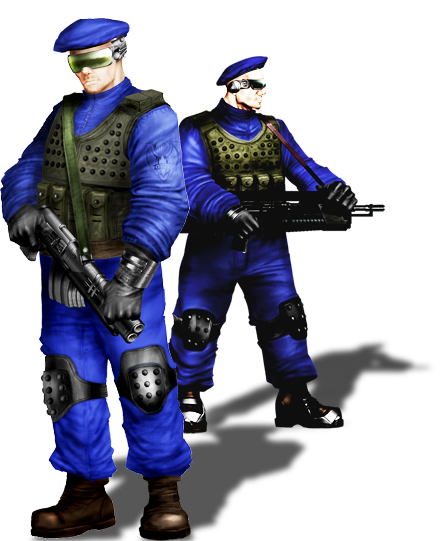 However, during an ordinary operation to infiltrate a gang of the Low Town, undercover agents detected a clandestine genetics laboratory, and that discovery helped to bust open a whole network of conspirators (which included members of the government and combat bio-terroristic groups funded by Corporations). All the connections were not fully identified; and even the main ideology of the society remained a mystery, for representatives of different levels had their own motivation and acted in order to achieve their goals. However, the whole conspiracy undoubtedly had an organized guidance, albeit barely visible behind the seemingly chaotic displays and attacks. Mission «Xenomorph» has been launched since the discovery of the conspiracy: it is a number of large-scale operational and combat activities to detect and eliminate all symptoms and effects of the project "Xenomorph". The System through the SSS (System Security Service) tried to limit the activities of the HTPD, but the scale of society destruction caused by «Xenomorph» and a high level of threat eventually resulted in police department cleaning up biological consequences of the project, detecting and destroying bio-terrorist groups, cutting off financial flows and identifying participation in corporate conspiracy. The operation officially ended over twenty times, but then resumed again and again. After the last relaunch it was never officially completed until the Decline of the System. "Progress is not only meant to provide comfort and better life, it also brings new and unknown threats ... Now we can deal with them", was said during the presentation of the new staff schedule at the Chiefs of Bureau meeting at the Central Department. 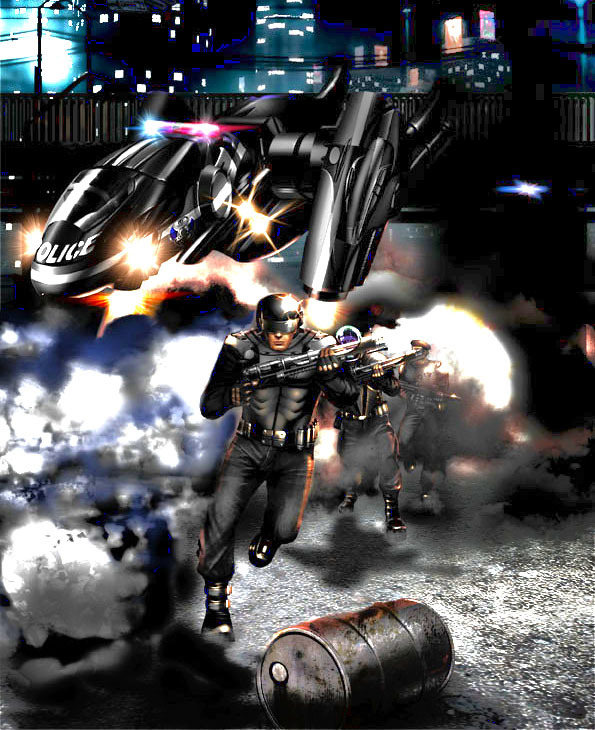 Development of the Reality (and primarily the Dual Reality system) resulted in the appearance of entirely new forms of crime, such as changing of the Reality that later on grew into the Architect Wars. Architects are those who had the sufficient intelligence to change the Reality "on the ball". Having faced this kind of crime for the first time ever, Police Department reacted wrong by continually denying the possibility of substituting the Reality. Only after a devastating attack on one of the offices, Central Department reluctantly admitted the problem. The investigation revealed that during the entire two-hour disastrous battle NO ONE entered the building, and all this time the police were fighting with themselves, because for some of the units the Reality was completely modified, and they perceived their colleagues as the attackers. The problem was solved in a straightforward yet effective manner. The legislation, prohibiting permanent connection to the Reality substituting the world, was passed. Complete transition to the Reality was made possible only through the landline stationary link. It didn’t get rid of the problem completely, because most of the time even a slower connection via a mobile link was enough for a malicious user to inject the fake world into a victim's mind, however it did get rid of 90% of attacks. The remaining 10% were put under control of the department of SSS (System Security Service). Moreover, the legislation on the introduction of technical Operatives (that can fight as equals with the most skilful Architects) in the staff management framework (including «Reality Correctors») was rushed in the Senate. In cases when the power of target link was not enough, Corrector could always hit a target with a dart that would instantly increase susceptibility of the Reality, which means it was actually a connection to the Reality via a stationary link. On one hand, it had a negative affect, because the aim could take full advantage of the Reality, respond faster to the environment, shoot more accurately, etc. On the other hand, it would get hyper-sensitive to any attacks in the cyberspace. Robot Revolts is a common name for all cases of disobedience or abnormal activities of robots and autonomous systems. This term was whipped up by journalists that, with great enthusiasm, were spreading the news about a scavenger robot turning dumpsters on the streets and presenting it as an attempt to overthrow the human race. Journalists would ignore the official public statements and explanations that the robot just lost one of the controllers, and that’s why at the attempt of emptying the dumpster into the garbage truck he didn't make it and scattered the trash all over the place. Even minor hacker attacks and hooliganism of techno-freaks did not in the slightest resemble a real rise of the machines, until a big and powerful force appeared. 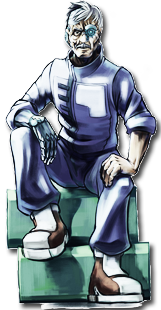 The Delici corporation was named after its founder, the genius roboteer Mr. Delici. At some point, his genius began moving in the wrong direction, and instead of being complacent, Mr. Delici got involved in techno occultism. He looked for soul in the lines of a code and movements of pneumatic mechanisms. And when he failed to find it, he decided to create it. 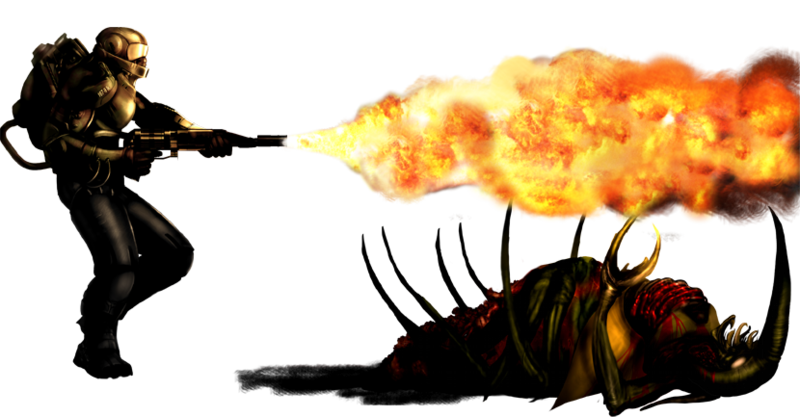 Blending some occult sciences with the technological advances, Delici created an army of killer robots. He believed that only through murders and "sacrificial offerings" robots could regain their "freedom". Promoting the "freedom of conscience" for his robots, Delici, perhaps unwittingly, lifted any limit (such as harming a human) for his juggernaut machines. As a result, improving self-learning functionality the heavy trucks and loaders immediately came to the conclusion that by squashing a human being they would reduce the drive time for a few seconds, and it is quite profitable. 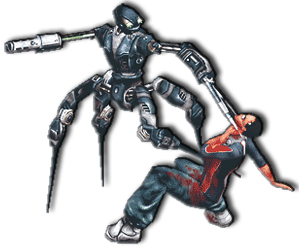 The fighter robots conducted training shooting using people as moving targets and improving their algorithmic reactions. The Police Department immediately responded and isolated the problem with a series of raids. They found out what the reason for the machines malfunctioning was, and who was responsible. 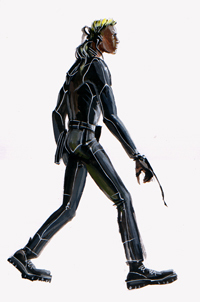 During the final attack on Delici Hanging Gardens (that's what his manor in the Heaven city was called) Delici himself, apparently, was killed, and his Corporation was completely nationalized and placed under the control of the SSS with a further partial sale of his assets. However, ever since then the fragments of "the Delici Code" tend to manifest in vacuum cleaning robots and autonomous orbital lighters, causing a lot of trouble. Delici’s body was never found, except a few fragments (officially, as a result of the 4-km high fall), and that added up to the mysteriousness of the story. All in all, the robots of any kinds were the objects of special attention from the police, and up until the Decline of the System the Act on the Limitation of the Robot’s Use wasfloating around somewhere on the sidelines of the government. It was modified, but hasn't been passed, for having tin helpers in everyday life was a bit too comfortable. The Mars War has become a difficult challenge for the Police. Military expeditions to Mars partially consisted of the colonial police. Officially, they were formed from the manpower of all HTPD departments. Due to the lack of volunteers, forced recruitment was introduced by the military. Departure to the Red Planet as part of the army expeditionary force was often a one-way ticket. That the reason why the HTPD got involved into criminal activities by catching and sending homeless people and drug addicts with false documents as a part of the colonial police, instead of the real policemen. Certainly, such actions seriously undermined already low efficiency of the police in the Martian environment. After the System lost the war on the control over the Red Planet, colonial police forces were disbanded. 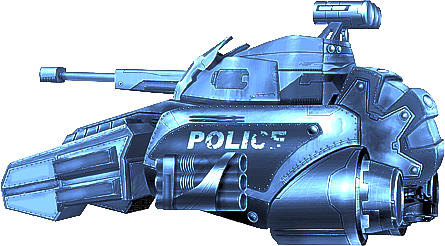 However, these fake «police» forces have played the significant role in the civil war on Mars. Local junkie named Tim has been sent to Mars disguised as a policemen, and yet he became one of the most prominent figures of the Dark Times, the famous hero and the Defender of the Farms. He played a key role in the seige of the Northern Capital. Each HTPD department has its own zone of responsibility. Every zone is divided into sectors. Usually departments are created with the intention to reach the nearest sectors with the patrolling grid and ensure security and order in each sector. At the same time most of the sector heads (local municipalities) tend to develop a special relationship with the heads of police departments that their zones come under. This is especially typical for those sectors of Metropolis that lie under a significant influence of corporations or private coalitions. For many of them the loyalty of the police is a matter of survival. In High Town it does not happen often and usually refers only to the corporate areas interested in the maximum security of their employees, whereas in Low Town friendship and confrontation with the police it is a matter of life and death for various trade coalitions, night clubs, production sites, etc. This triggers the System-induced competition between departments. Good relationship with any particular corporation, secured by the solid performance in sectors (which implies minimum amount of crimes, high crime detection rate, rapid response and the elimination of threats), allows a certain department to obtain additional extrabudgetary funding or delivery of special components either at a huge discount or even free of charge. 1. Reducing the likelihood of committing crimes. The more policemen are in the sector, the less there's a chance of someone doing something illegal. 2. Prevention of crimes. If someone does decide to do something illegal, the patrol could easily detect an intruder before the commission of the offence and apprehend him, or find another way tp prevent the violation of the law. 3. If the crime does take place, the patrol can conduct a hot pursuit and arrest the criminals immediately. 4. If the patrol forces are not enough to arrest the perpetrator (or perpetrators), patrol can block access to the scene of the crime to prevent the escape of the criminals and try to hold the field until the arrival of Rapid Response Team. Every department delegates the main workload for patrolling to patrol drones and the controllers. More effective are the standard patrols, and in some cases there may be an involvement of Special Forces such as stormtroopers. However, it's important to understand that storm troopers are only able to carry on patrol duties for a short period of time (their heavy equipment takes its toll), let alone the fact that they make people feel scary rather than protected. Certainly, the bigger the patrol presence in the sector is, the more successful their activities are. The best a standalone patrol drone can do is demonstrate the presence of the police, but it can not prevent the crime, and, in worst case scenario, it can be stolen by hackers. The controllers are cheap to use and gear up. It’s very easy to get a large amount of patrolling through the use of controllers, but in case of a serious crime (such as a bank robbery performed by a well-coordinated gang) the controllers can only obstruct the retreat, as opposed to stopping or arresting the outlaws. A competent head of the department always pays attention to the controlled sectors and thoroughly plans and allocates patrols, providing cover for the most dangerous areas. Transport accessibility in the sectors plays an important role in ensuring safety. Even a large police department does not always possess a sufficient number of vehicles to provide them to all patrols and Rapid Response teams. That’s the reason why patrolling units of large areas tend to get to the allocated sector by public transport. Moreover, even Rapid Response teams are sometimes sent out to high-priority calls by public transport. 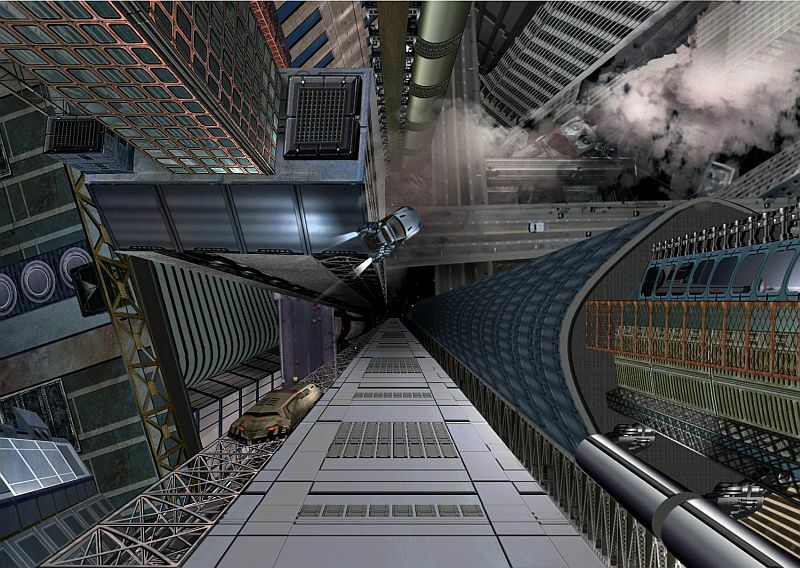 It makes perfect sense, for it might take a lot of time for a special forces track to get to the destination point through traffic and the meandering cobweb of multi-level street junctions, while maglev (train that uses magnetic levitation to move around without touching the ground) covers more then 60% of High Town and helps to avoid traffic. Of course, you won't see heavy equipped stormtroopers to go and solve a hostages situation by train to the site of a, but it's quite normal for police patrols in full armor to travel by public transport. Usually, small departments have no more than one or two patrol cars which, depending on the preferences of the Chief of the department, can be used either for patrolling or as a rapid respond unit vehicle. 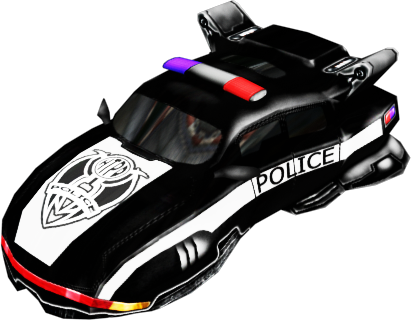 The increasing number of calls tends to cause the appearance the police armored cars, the universal "workhorse" of the force. A truck like this is capable of delivering not only patrols to the place of operation, but also SWAT teams, and heavy equipped stormtroopers. It's quick enough and it only uses public roads. Robots are an integral part of any police department. 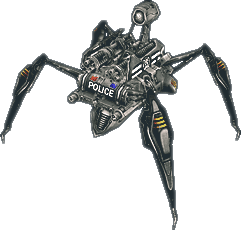 It is hard to imagine the city landscape without the patrolling flying drones or police SWAT team not accompanied by the Cyber Spider. However, things don’t go so well in that direction. The use of robots is a personal headache of the department’s chiefs, as they require special transportation to get delivered to the sector, special maintenance, and, finally, special software, because standard applications usually do not correspond to the goals of police operations. It wasn’t straight away that the departments got the ability to purchase and modify robots. It was assumed for a long time that the police "robotization" will harm the departments’ activity in each sector. There’s also a moral aspect of "dehumanization" of the police service in the eyes of the townsfolk, as well as a matter of "manipulating" when over-zealous chiefs of departments find a way of overuse the robots instead of the training the police staff. Also, the last but not the least, there’s a question of safety of the civilians, because cases of theft of robots and drones are not so uncommon, and there’s always a possibility for a heavy charging robot meant to defend the citizens to suddenly get reprogrammed due to external interference and begin to terrorize the streets. 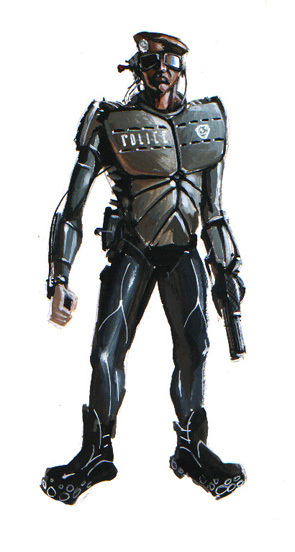 Eventually, all the aspects of the use of robots in the police force were well adjusted. It was forbidden to assign heavy charging robots for self-dependent patrols, whereas robots and drones with an ability of autonomous action in the sectors got required to be equipped only with non-lethal weapons. Robots are usually programmed at the base, and during the implementation of tasks can only change software by command of the operating officer. More complicated adjustments would require bringing in the Techs – staff of the technical department that are capable of providing complex modifications of software for robots (and not only the police ones) in the field. 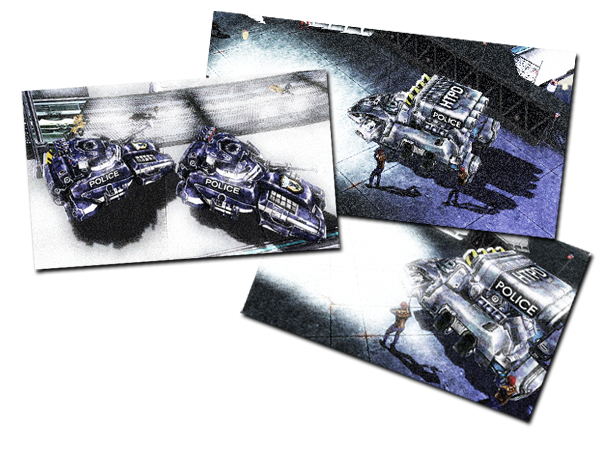 The appearance of heavy machinery as part of regular police structures in HTPD is primarily due to the Syndicate. After several fierce battles in Low Town, when the Syndicate did not hesitate to use contraband tanks and infantry combat vehicles from Mars, the Department urgently rushed the law through the Senate allowing heavy weapons in the sectoral departments. The use of such equipment requires a special warrant. And usually the operation involving assault tanks or city rocket launchers get authorized only for in Low Town. However there are cases of use of such machinery both in High Town and Heavenly City. Any action conducted by the police is regulated by the set of instructions and rules of the Systems. 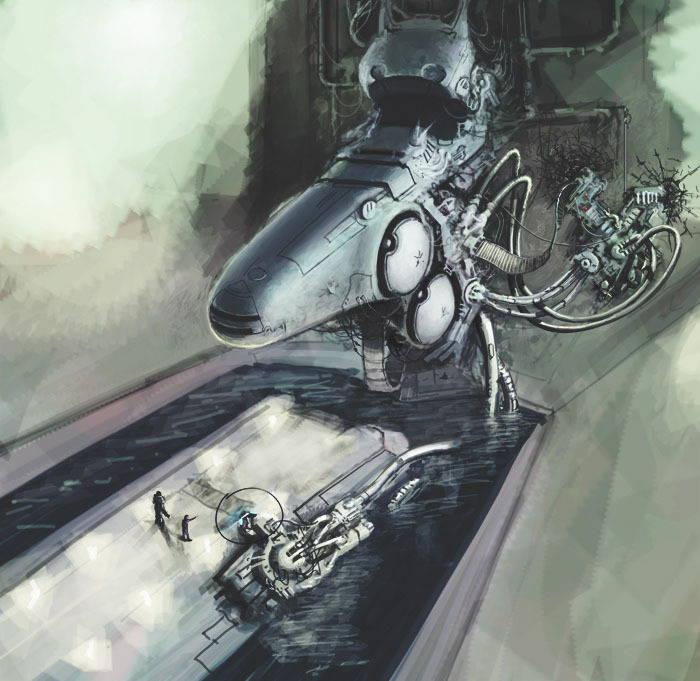 In any eventuality, whether it is surveillance at the amusement quarter or raid on the illegal military robots factory, a department chief must receive an automatically issued warrant. The warrant is issued by the System and clearly defines a set of capabilities for any given task. This warrant system has been causing discontent among the department chiefs for quite a long time, but for the System it is the only way to control overly assiduous officers trying to involve heavy machinery and even tanks in arresting an ordinary pickpocketer in the GigaMarket area of the High Town. However, the warrant gives flexibility to the number and quality of the deployed forces, and only apparent inconsistencies usually get rejected (such as the case of aforementioned usage of tank in the simplest of all operations). • Leisure – some police officers do not mind to gather after hours and have a bottle or two of oceanic beer. • Profits – since each department chooses suppliers of equipment and weapons itself, the departments may combine together to influence the suppliers. • Opposition – some police officers regularly violate the law, abusing power given to them, and they combine their forces to resist the ISS (Internal Security Service). The infamous “Link 12” is one of such unions. A good indication of the highly developed "transport logistics" management of the department is the existence of their own police cruisers and landings for hover vehicles. 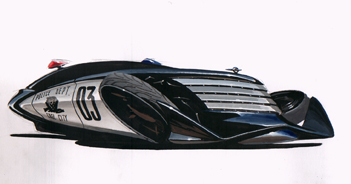 Cruisers enable the delivery of assault groups to any place in Metropolis as the crow flies. The System’s directive №15VU-aero.33.h specifies the right to provide the maximum priority of the security forces vessels in the movement planning in the airspace of Metropolis. 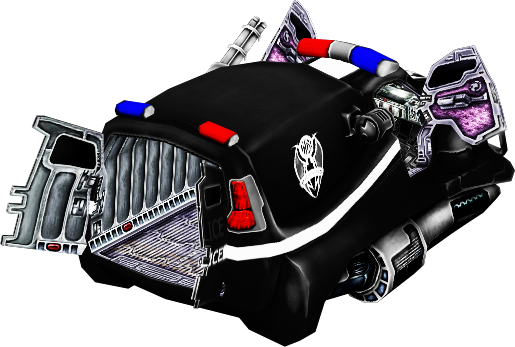 Also cruisers allow to send the police forces in Heavenly City and Low Town without the use of special and public elevators, but it’s important to know that this kind of delivery is not safe. 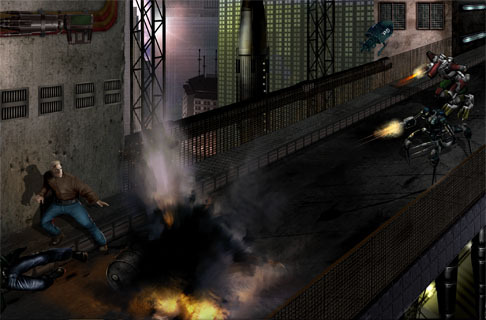 In Low Town there are frequent cases of cruisers being bombarded from the ground, while in Heaven City the private security services hold almost total control over the air space, which makes it impossible to use cruisers in covert operations (and other kinds of operations in the that area are rare). Traffic management’s power peaks with the existence of its own suborbital shuttles. Permission to use such a vehicle is given to management with its addition to the zone of responsibility of a space object, as well as the inclusion of the department to the “capable of remote tasks” list. 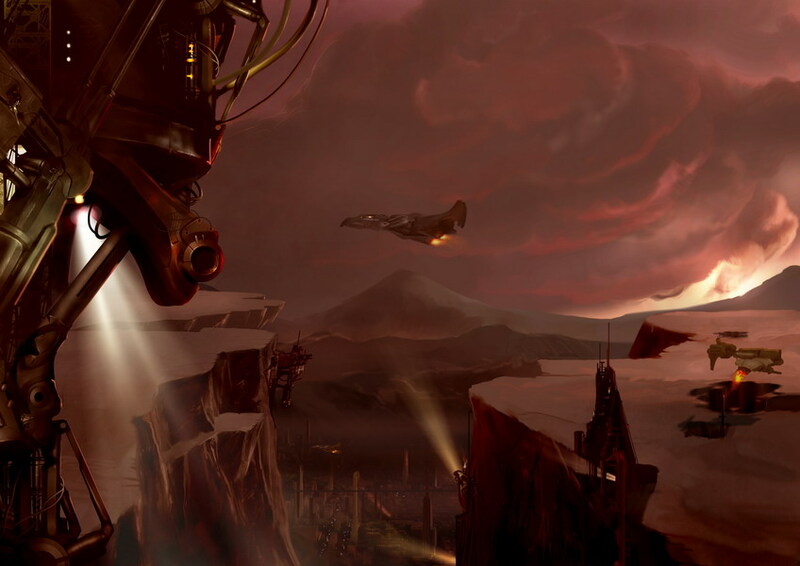 These are the special tasks from the System at the long range radius from Metropolis, such as underwater colonies, or distant agriculture autonomous settlements. Only few departments can boast of such a privilege, but that makes it even more desirable for rest of them.